Mil-rite is our most popular electric grain mill model with the stainless steel grinding attachment. Suggested retail price $696.94. It is available in 120 VAC, 700 peak watt, 60HZ or 220 VAC, 50HZ. 220 VAC motors are suitable for Mexico, Australia, New Zealand, Europe and most other countries in the world outside of United States and Canada. The easy dial adjustment knob in the front allows for quick and accurate grinding setting. All metal transmission and all double sealed stainless steel bearings would categorize it a high performance American Made workhorse. To customize your needs, we also stock (4) four different types of grinding attachments and rollers for different types of grains and seeds (almonds, masa, tirtilas, beans, nixtamal, etc). If you can specify the type of material you want to grind before you purchase your mill, we will make sure to send the correct attachment for your application with your mill. Please do not hesitate to call or e-mail us if you have any questions or have a specific application in mind. All our products are made in USA. Due to our strict quality control standards and supplier manufacturing deadlines our delivery time may vary depending on which color and item you select. The standard delivery time on all non-special orders and parts is 1 to 2 weeks at this time. All colors except polished non painted aluminum and all orders paid with a check or money order to receive free shipping are considered special orders and delivery time may be much longer. Please call us at 208-254-3737 during our regular business hours before placing your order to find our current delivery schedule on this item. Our man made ceramic stone attachment is used to obtain very fine, traditional "stone ground" flour. The stone attachment should not be washed in water. The stones are designed to be self cleaning and require no special care. 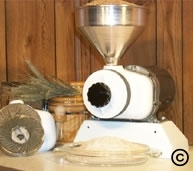 The mil-rite is designed for slow , quiet household operation and is not considered a high output grain mill. It will produce anywhere from 1/2 to 1.5 cups of bread flour per minute depending on the type of grain used and the desired setting. The stainless steel attachment can be used on virtually any grains, including wheat, beans, soy, herbs, corn, rice, peanuts, or any other oily or moist grains or legumes. The stainless steel attachment is dishwasher safe and can be cleaned with hot water if needed. You may purchase the steel burrs separately at a later time or purchase unit number 18S, which includes both the attachments. Both the attachments for the Mil-rite are guaranteed against wear, cracking, damage, and finesse of the flour produced for 10 years. Do to the extreme hard nature of the following items, we advise against grinding the following grains in your Mil-rite: salt, popcorn or white or enriched rice of any kind. A optional special order two way switch is also available that may be installed in all the Mil-Rites upon special request. This feature may only be installed in the factory and additional cost of $79.95 will apply. The two way switch allows the machine to be reversed, which means that the finesse of the flour can be adjusted easier than with the only the standard one way switch. The reversibility of the machine also allows the meat grinder attachment to be used. The meat grinder attachment for the mil-rite or Mil-master can be used to grind sprouted grains, grinding masa dough directly from wet nixtamal (corn boiled in alkali), wet corn or any other grains. Please specify if you would like this extra feature added to your mill when ordering. Available in 12 different colors. To view colors please check out our home page. Gift certificates are available. Manual handle sold separately and this electric mill can be effectively used manually if desired. Free shipping on this item if paid with a check or money order.